Last weekend we stopped by Becker Galleries on Granville Island to check out the grand opening of the Unintended Calculations exhibit. This special exhibit showcases the individual work of four international artists who collaborated to produce the new stylish murals that now grace two exterior walls of the Moda Hotel Vancouver. 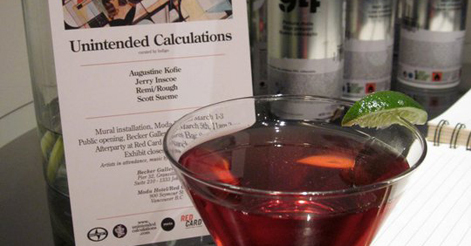 At this fun gallery gathering, special ‘Unintentional Calculations’ cocktails were served to exhibit-goers as the evening progressed. This week’s Drink of the Week, the ‘Unintended Calculations’ cocktail, is a punchy combination of Absolut Berri AÃ§aÃ­ and cranberry juice, topped with bubbly soda water and a twist of fresh lime juice. For those interested in viewing the show, the Unintended Calculations exhibit will be on it will be on display to the public until March 26th – we encourage you all to stop by!